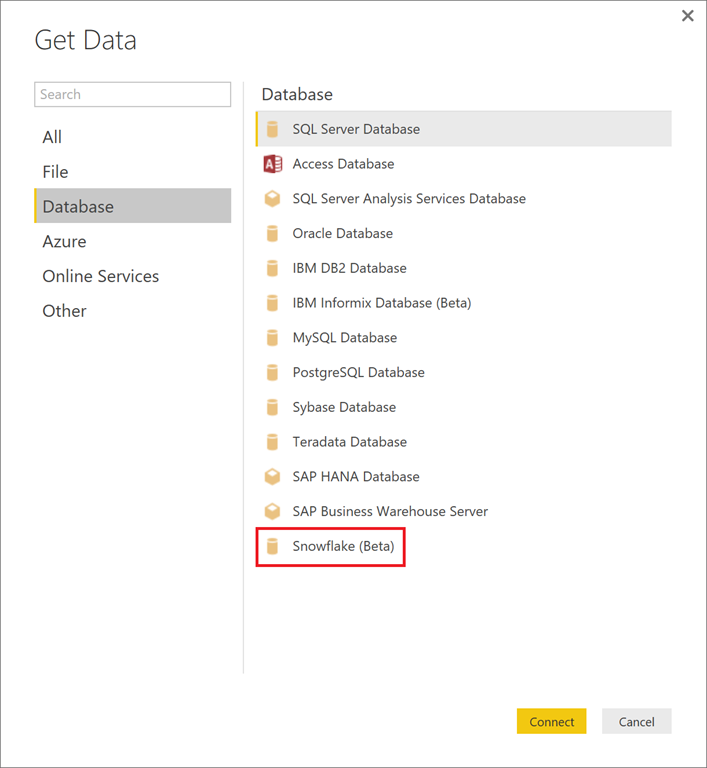 As part of the Power BI Desktop August Update we are very excited to announce a preview of a new data connector for Snowflake. Snowflake is a cloud-native elastic data warehouse service that makes it easy to bring together data from disparate sources and make it available to all users and systems that need to analyze it. With the new Power BI Desktop connector, users can import data from Snowflake, combine it with data from other sources, and build rich data visuals as part of their Power BI reports. In order to use this new connector, users need to first enable the Preview feature option within the Options dialog (File -> Options and Settings -> Options). After the feature has been enabled, users can find the Snowflake connector within the “Get Data” dialog, under the Database category. In the connector dialog, users can specify the Snowflake Server and Warehouse to connect to. 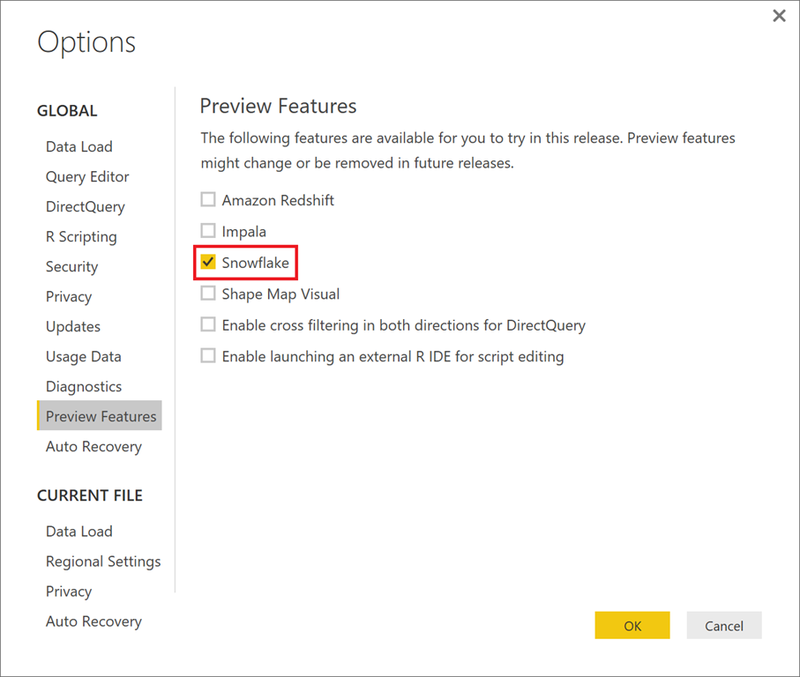 Once the connection details have been specified, Power BI Desktop will attempt to connect to Snowflake, which will require users to specify credentials. In Power BI Desktop, credentials are only asked from the user on first-time connection, after which they are stored as part of the user profile and can be managed from the “Data Source Settings” dialog (under File -> Options and Settings). Subsequent connections to Snowflake will reuse the stored credentials for the current user. After the connection has been successfully established and the user has been authenticated, the Navigator dialog will allow users to browse the list of databases available within the specified warehouse. 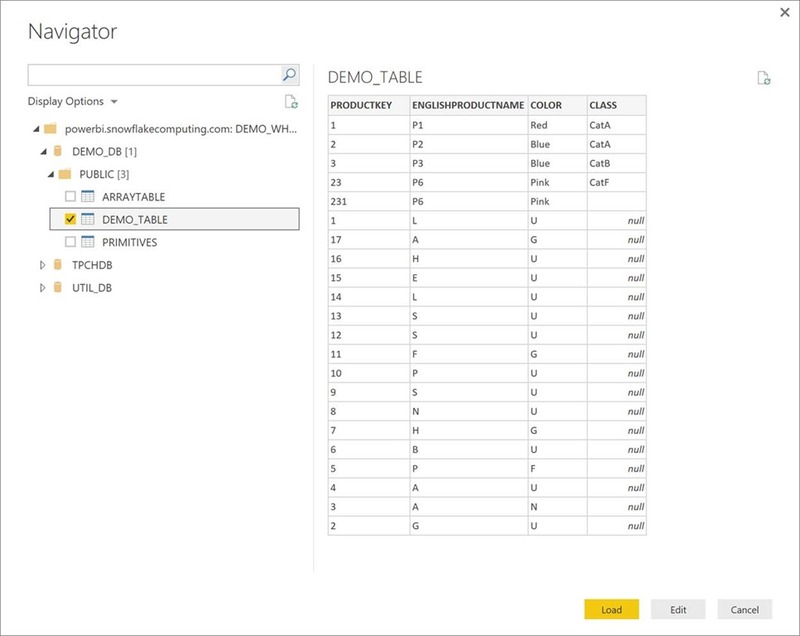 In this dialog, users can preview and select one or multiple tables to use in their Power BI report. Load: This will load all data rows from each of the tables selected into the local Power BI Desktop data model, from where users can build their reports. Stay tuned for improvements to the Snowflake connector and for many other connectors in upcoming releases. If yours isn’t supported yet, just let us know.